The weather has been glorious lately and I’ve been spending many of my off-duty hours strolling the streets of my city. One thing that I keep noticing is how incredibly creative people can be when it comes to claiming a bit of open-air real estate. True, there are plenty of lovely large decks, expertly crafted by carpenters, and even a few full-blown outdoor living rooms, but I am even fonder of what I call “pop-ups.” Easy to put together, a pop-up exterior space is a patio, porch, or private yard fashioned out of simple materials and with minimal effort. Here are 5 suggestions for you to try at home, just in time for the Fourth of July. Take a tip from one of my neighbors, who has the most amazing flower garden facing the street, but absolutely zero backyard; I’m sure she won’t mind me sharing her imaginative solution with you. This clever lady set up 3 oversized planters, complete with decorative shrubs, to block off the last few feet of her driveway. Now she still has plenty of room to park her car, plus a secluded little area to sit and read the morning paper … or enjoy a peaceful snooze stretched out on her chaise longue. Try another idea gleaned from right in my neighborhood – once again inspired by a couple of homeowners with limited backyard footage. These ingenious outdoor lovers grew their own unique and attractive privacy fence. Three-foot high stalks of shasta daisies may not shield as well as a towering brick wall, but they will clearly define your front yard as private property. Added bonus: shastas are perennials, so once planted, they should serve you well for plenty of summers to come. Going a little farther afield, here’s a concept that I recently picked up from talking to a woman in California. Due to the water shortage out west, lawns are not exactly on the landscaping radar these days. Instead, she transformed the knee-high patch of weeds next to her small home into a charming pocket-sized Zen garden. It’s surfaced with natural river pebbles (smooth-edged so they don’t hurt the paws of her sweet doggies) and surrounded by pretty, low-water plantings. Another fast and flexible way to set up your personal outside oasis is by putting together a patio with pavers of concrete, wood, or tile. Prepare the area where you’d like to place them by digging about 6” into the soil (contact a one-call service first, so you don’t disturb any underground pipes, wiring, or cables). Lay polymeric sand or landscaping cloth as a weed barrier. Then top with pavers in the design of your choice. Stain concrete pavers for a colorful effect, if you like. This is so easy to do -- and easy to change or move if the fancy takes you. A low-budget alternative is recycling brick. 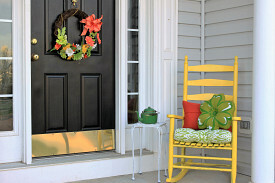 You can upgrade even that humble concrete slab at your front entrance into a petite porch. Add a touch of color using bright flower arrangements that won’t impinge on your limited floor space – hanging baskets or even a dainty floral wreath on the door will do just fine. Then choose a few small-scale outdoor furnishings to change it to the perfect place to sit and watch the world go by … as you sip serenely from a tall cool glass of raspberry lemonade. If all you have room for is a single chair, please do make it a rocker, for an instant summery feel.